Seen the Clinch Gear Fedor Emelianenko Strikeforce Heavyweight GP Fight Shorts yet? This great pair of fight shorts is worn by the Last Emperor himself. The Clinch Gear Fedor Emelianenko Strikeforce Heavyweight GP Fight Shorts is the stuff of legend, featuring a fully sublimated body with the sponsor logos from Fedor’s Strikeforce contest versus Fabricio Werdum last June 26, 2010. These shorts are made with high quality, double-ply polyester with flat-lock stitching. 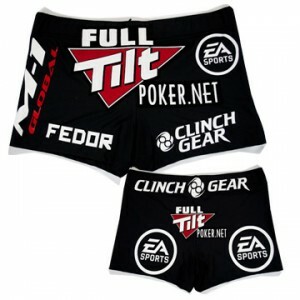 The Clinch Gear Fedor Emelianenko Strikeforce Heavyweight GP Fight Shorts is available at MMAOverload for $59.99.